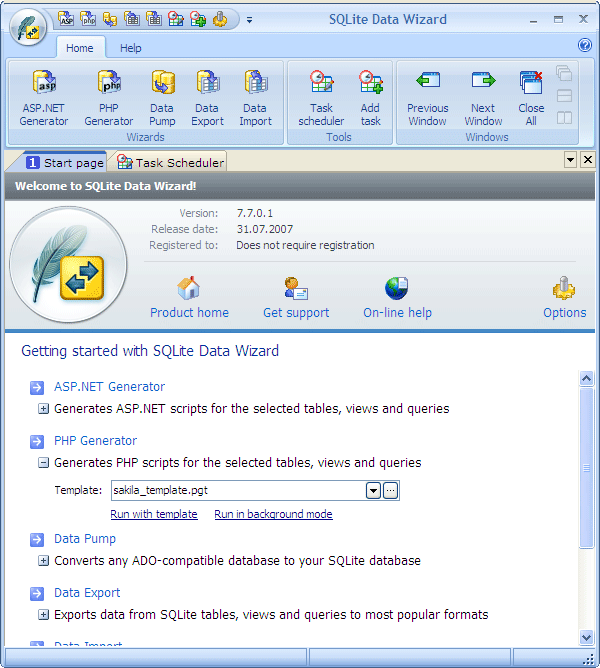 SQLite Data Wizard is a powerful Windows GUI utility for managing data. It provides you with a number of easy-to-use wizards for performing the required data manipulation easily and quickly. SQLite Data Wizard allows you to generate PHP scripts for the selected tables and queries, convert any ADO-compatible database to the SQLite database, export data from tables and queries to most popular formats, and import data into the tables. * Includes Graphical Builder to map source file columns to target table fields in a few mouse clicks. * Uses bulk loading commands to speed up the import process. * Exports data from SQLite tables, views and queries to the 17 most popular file formats including MS Excel, HTML, XML, PDF, etc. * Allows you to fully customize output files including header and footer, fonts, colors, data formats, encoding, etc. * Creates a full set of ASP.NET scripts for working with SQLite tables, views and queries through the web. * Allows to create webpages of your own style: color scheme, images, fonts, etc. a�? Protects generated scripts with advanced security settings. SQLite3 database manager. Development tool for managing all database objects. Qweas is providing links to SQLite Data Wizard 11.1 as a courtesy, and makes no representations regarding SQLite Data Wizard or any other applications or any information related thereto. Any questions, complaints or claims regarding this application SQLite Data Wizard 11.1 must be directed to the appropriate software vendor. You may click the publisher link of SQLite Data Wizard on the top of this page to get more details about the vendor.